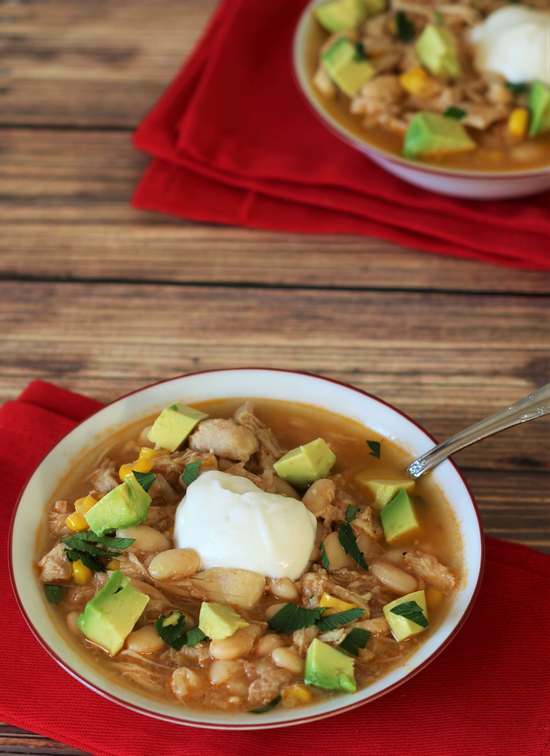 Slow Cooker Chipotle White Bean Chicken Chowder: This hearty south-of-the-border chowder features a semi-spicy broth with bites of tender, shredded chicken, white beans and sweet corn. This post is sponsored by my friends at Hurst’s Beans. I love working with this great, midwest family-owned company. To see all the recipes that I’ve created with their products go here. 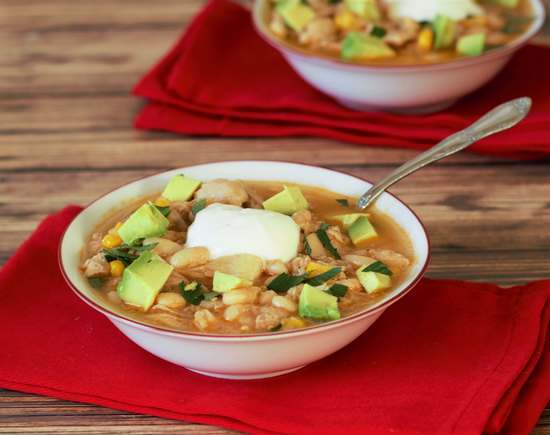 I don’t know about you but at my house we all love soups, chowders, chilis, stews…basically anything that’s dinner in a bowl. 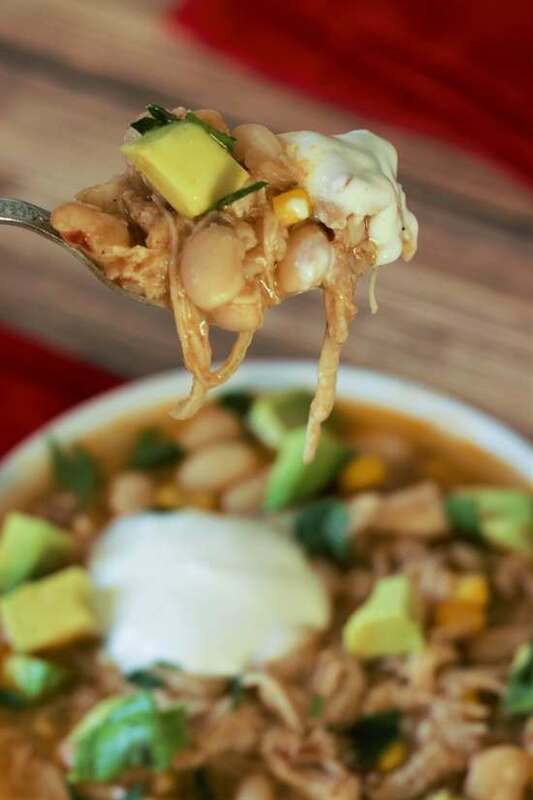 And it’s a double bonus when it’s southwestern anything…we love a dollop of sour cream and diced avocados anytime we can get it. The weather here has been really just so beautiful. The blue skies and orange leaves play magnificently off of each other. But it’s starting to get a little chilly. I know it’s soup season if I have to wear socks. I’m one of those people that has really poor circulation to the feet. My toes are constantly freezing in the winter. 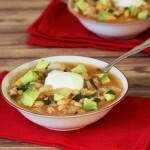 Today, as I’m typing, I’m wearing socks…so I think it’s a good day for some chicken and corn chowder! And really, even if I wasn’t wearing socks I think it would be a good day for this recipe. I didn’t even realize it while I was making it–but it’s actually gluten free. So this is a good option to share with your friends who have celiac disease. For this recipe I decided to use Hurst’s Great Northern Beans. 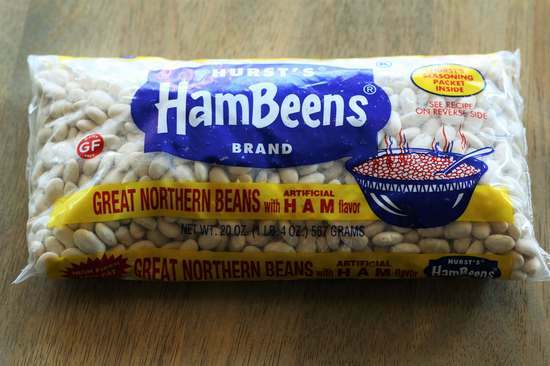 You can find these beans in many grocery stores. If you want to find out where you can find Hurst’s products near you you can always email info@nkhurst.com . I love usings Hurst’s beans because they always come with a little seasoning packet. 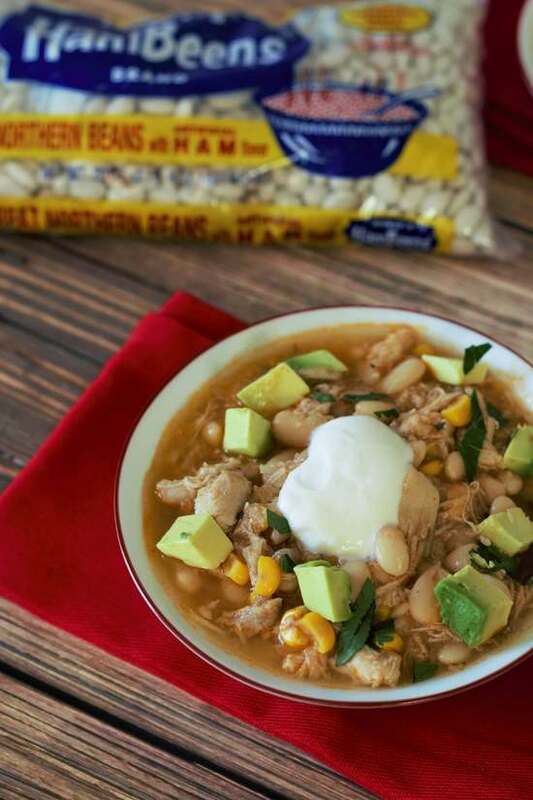 My husband always gives me a compliment when I use their products “this has really great flavor!” Little does he know that most all of the flavor is coming from the little packet included with the dried beans. So don’t throw the packet away. Set it aside for later because we’ll be using it. Start making this soup the night before by soaking the beans. 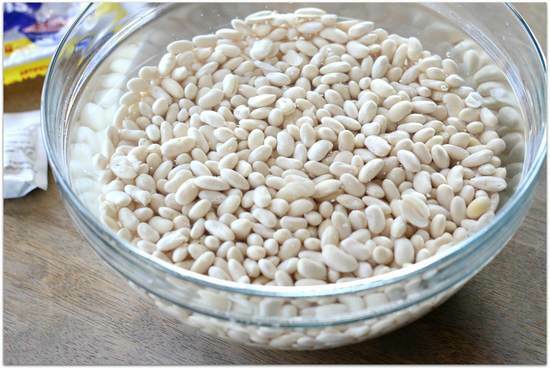 I have found that soaking dried beans overnight is really the best choice. The beans have a better consistency after they are cooked. If you forget you can always do the quick soak method. This just means you rinse the beans, place the beans in a pot and cover them with 2 inches of water, bring the beans to a boil over high heat. Cook the beans for one minute, remove the pot from the heat, cover the pot with a lid and let them soak in the water for one hour. After the hour is up you can drain the beans and rinse them once again. Then they will be recipe ready! This next step may seem a little weird to some of you but I’ve learned it from the experts at America’s Test Kitchen. 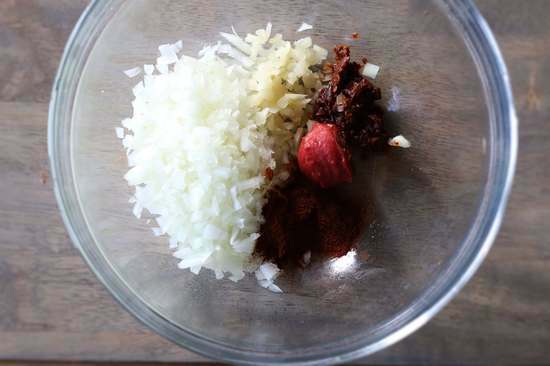 It’s just to saute the onions and garlic in the microwave and bloom the spices at the same time. 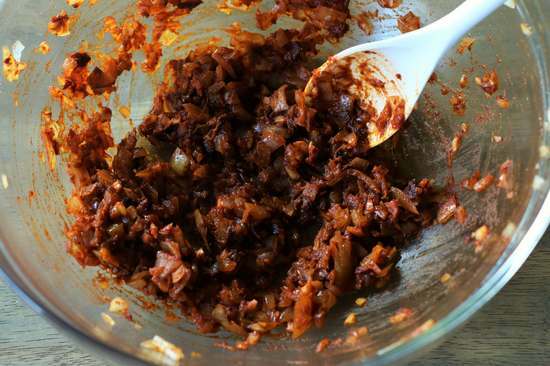 Just use a microwave-safe bowl and add in your a little bit of oil, diced onions, garlic, tomato paste, chili powder and the minced chipotles in adobo sauce. You’ll microwave it for about 5 minutes. I like to stir every 90 seconds or so. This is what the mixture will look like when it’s done in the microwave. It’s so full of flavor! Add this mixture along with your beans and some water and chicken and salt to the slow cooker. This recipe will take several hours to cook so you can leave it all day if you’re going to be working. I turned mine up to high and it took 5 1/2 hours so on low it will take about 8-9 hours to cook. When the beans were soft I ladled out a couple of cups of the beans and added them to my blender. I pureed the beans and then added them back into the crockpot to make more of a creamy than broth-y consistency. I then fished out the chicken thighs and shredded them up. They were so tender that it took about 2 seconds. This is the point where you’ll add in the seasoning packet. I also added in some sweet corn (I used frozen, I find that frozen corn really is easiest for me and has great flavor). We topped ours with a little sour cream and diced up some ripe avocados. Try this recipe out this week. It would be a good one for Halloween night! I don’t have the seasoning packet. Suggestions for what to use instead?